Today we are looking at the top 10 hottest kids toys on the market! These toys are high-quality and all for sale for reasonable prices on Amazon.com. Kids glued to screens all day is bad for their health and wellness, so it is important to get our kids up and moving, experiencing things in real time! Whether for gifts or just because you love your kids, these toys are the most popular on the market and won’t disappoint! The Little Tikes Light n’ Go Activity Walker will make your baby laugh with glee, all while helping them learn how to walk and stand on their own. The colorful light show and shapes that project on the ground encourages toddlers to push the walker forward further and further! You’ll be surprised at how much your toddler will love the activities board on the front, with plenty of textures and toys to bop and pull. The VTech Learning Carrier is an excellent way to engage kids about kindness towards our furry friends. 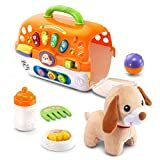 Kids will love all the different accessories the puppy plush comes with; such as a food bowl, bottle, and comb to brush through puppy’s hair. The carrier comes in two stylish color schemes: Orange and Pink. For the animal-lover, this is a must-have! The N-Strike is a hot toy item this year among school aged kids and preteens alike. Firing soft darts in rapid succession switches on their primal instinct to play. The N-Strike comes with targets so kids can practice their aim and hand-eye coordination. The Blaster comes in a variety of bright, striking colors that kids will love. The N-Strike Elite Strongarm Blaster is a bestseller on Amazon! Little People by Fischer-Price are a popular first toy for many babies and toddlers, but were always lacking in characters that connected with our kids. Disney’s partnership with Fischer-Price lets toddlers enjoy safe, durable toys in the image of their favorite Disney princesses. A wonderful gift and a toy that will be treasured always! Gamifying education is a proven method of helping kids learn better. Our children these days are exposed to so much technology, why not give them a head start with something that is more productive? 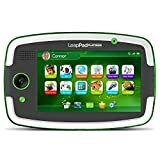 The LeapFrog LeapPad does just that, offering kid-targeted apps that teach kids math, reading, language arts, science and problem-solving skills. While on the pricier side, there is no doubt any kid would get hours of wholesome entertainment out of the LeapPad system. It simply pays for itself! Minecraft is an internationally popular videogame franchise and has finally come to the real world! 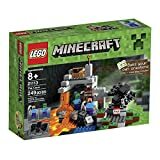 Kids love showing off their master builder skills using these sets. Exploring forgotten caves crawling with Creepers, Minecraft is both engaging and encourages important skills that kids need to learn to succeed such as building, logic and creative expression. It can be difficult to get kids to get off their consoles and smart devices, and this is the perfect solution! Baby Alive, a baby so real! Baby Alive eats special food when you feed her for a realistic, engaging playtime experience. Once Baby Alive has eaten her fill, she leaves a “surprise” in her diaper for a dedicated play-mommy to clean up. Kids with a natural caregiving instinct will love this toy! 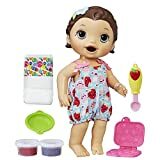 Available in a wide range of skin tones and hair colors, Baby Alive includes; one doll, one diaper, 2 containers of reusable doll food, 3 fashion accessories, and instructions. Play-Doh has been a trusted brand for families for many years now and their products are still as high-quality as ever. 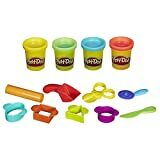 A fantastic toy for toddlers and babies, the Play-Doh Starter set helps kids explore their creativity. The colorful dough is non-toxic and safe to be used by children of all ages. The Play-Doh Starter Set includes tools such as a roller, pizza cutter, scoop and shaped cutters to help bring out your child’s expressive side. Collectible and cute, Shopkins are one of the summer’s hottest toys. Shopkins are little inanimate critters shaped like furniture, apparel, food, and decorations. Shopkins is a brand that sells many different products, but the most popular are their collectible figurines. Each figure comes in a mixed mystery bag so it’s fun to collect them all! A warning for small mouths, these toys are meant for older kids and not for toddlers. Hatchimals are the hottest new toy two years running. Hatchimals are the world’s first “hatchable” toy! Amazing, new technology uses heat and friction to warm up the Hatchimal egg’s colorful shell until it is ready to burst out. Each Hatchimal is unique and belongs to a special family of Hatchimals, all with glittery wings. Kids will love to play with the 70 collectible Hatchimal’s available right now, but act quickly!